Where Dreams Come True... Weddings at The Heritage Killenard. The 5 star Heritage Killenard is a hidden jewel of the midlands and offers a host of facilities and first-rate service for your Wedding Day. From fine food and glorious interiors to a world class spa and a host of many other leisure facilities for you and your guests to enjoy during your stay at The Heritage Killenard. Located one hour from Dublin and only minutes from the M7 the hotel has all the ingredients to make you Wedding Day dreams come true. The magnificent ballroom with its own bar is self-contained with dazzling chandeliers and gold gilt mirrors and a purpose built stage with automated drapes. Choose from a variety of fine food, world class wines and champagnes. The hotel offers a variety of dining and accommodation styles to suit your guests needs. Many of our wedding parties decide to stay an additional night and host a family or friends dinner or barbecue. On your wedding night you will enjoy the opulent surroundings of a penthouse suite with views across the rolling Laois countryside. The dedicated Wedding team will be at hand to help make your wedding day a prefect and memorable day for you and your guests. There are also a number of local churches and suitable venues for your wedding photography such as Emo Court and the National Stud & Gardens. Whether you dream of having a large and lavish wedding or an intimate gathering in glamorous surroundings, The Heritage Killenard has it all. Best day of our lives in the best possible surroundings! Trisha and John in the Heritage were absolutely outstanding to deal with. Cannot praise them enough, nothing was a problem, service was top class. The food was incredible and everyone commented on the food, service, decor. Cannot revommend the Heritage and it’s staff enough! We had the best day at The Heritage for our wedding. Everything was top class and seamless. From the first contact with wedding coordinator David right through to the wee hours of the reception, the staff and service were faultless. Guests were very impressed with the venue, the service and the food. We would highly recommend this hotel, best in the midlands by far. Amazing hotel. Trisha is such a credit to them, she literally couldnt help any more no matter what we asked her. Defo recommend to any one. We could not fault this hotel at all. From the moment we booked nothing was too much for them. They helped so much in the lead up to the wedding. The wedding coordinator Trisha was so amazing and positive with all our ideas and put great thought into our table plans and decorations. The food, Ian the chef is amazing! So easy to deal with, great choices and flavour was extraordinary. All the staff work so seamlessly. John the banqueting manager runs a very efficient day, keeping on top of every little detail. We had such an amazing day and did not have to question or think about any details. The Heritage in Killenard was absolutely fantastic. The food, service everything was excellent. The professionalism of the staff was out of this world with particular mention to Trisha our wedding coordinator who went above and beyond and John on the day for his patience and professionalism. We could not reccomend the Heritage enough. All our guests commented on the fabulous food, the courteous staff and the gorgeous hotel itself. Brilliant venue. Staff extremely helpful and we had an amazing day. We had the most amazing wedding day at The Heritage Killenard and would like to thank David Hannify and all the staff for making our day so special. We planned our wedding from Australia but never found it daunting when we dealt with the hotel as everything was so organised and there was absolutely no stress. The Heritage provides 5 star service and I would highly recommend to any couple. A fantastic reception in Killenard from the moment we arrived. Trisha was absolutely amazing to deal with from day one. She is such a treasure and the hotel are so lucky to have her. The meal was beautiful. Thanks Ian. The staff were brilliant on the day and the next day driving around our car and packing it up. I would highly recommend anyone to get married here. We had such an amazing two nights in March for our wedding. Trish was our coordinator and nothing was too much trouble. The food was amazing on the night & thanks a million to executive chef Ian for letting us change around a few things on the menu :) I would highly recommend the Heritage Killenard & can’t wait to go back for a night for our anniversary! Fabulous venue with great attention to detail. Guests of all ages were looked after and enjoyed their stay. We had a civil ceremony followed by a meal for 20 close family members and then later that month had wedding service with a buffet etc for over 200 people. There are facilities to cater for all sizes of weddings. The wedding suites are just amazing. They have to be been to be appreciated. The staff are extremely helpful and friendly. My first experience with the Heritage was when I went on a spa break with my sister. When I first stepped inside the hotel I had a very positive feeling and I knew instantaneously that if I was ever to get married, I would have my reception there. Luckily when the time came and myself and my husband viewed the hotel together, he similarly shared the same feeling. From our initial contact with the wedding team when we expressed an interest in the hotel as a potential venue to celebrate our wedding and up to and after our wedding day, the team were a pleasure to deal with. They were very professional and very accommodating of all of our needs. In addition to the beautiful venue and the professional and courteous nature of the staff, the food and service on the wedding day was top class. We have received lots of praise from our guests regarding how much they enjoyed our wedding, a lot of this praise was due to the exceptional service and quality of food provided by the Heritage. We would like to extend special praise to Trisha Broughan who is excellent in her role as events executive. I would highly recommend the Heritage as a potential wedding venue for any newly engaged couples without any hesitation. The whole team at The Heritage could not have been more helpful in the run up to the wedding and on the day. No request was too small or too big, they made us and all our guests feel so welcome and everybody kept telling me how excellent the hotel staff were during their stay. David was our Wedding Planner and he was so lovely to deal with and made sure everything ran smoothly along with John, the banqueting manager, who was also brilliant. The food was delicious and exactly as we requested at the tasting. Ian the head chef was so helpful and professional, he made us feel very confident all was going to be great on the day which it was. I honestly picked the Heritage as I have heard such good things from other brides and friends and really wanted to choose somewhere I could trust for high standards in food and service as I have heard so many awful stories I didnt want to risk somewhere I hadn't received referrals from. The hotel is 5 star but I found reasonably priced considering some 4 star hotels in area were almost charging the same. Our penthouse and the views were amazing and we got married in the church across the road which was so convenient esp with time pressure on the day. I can't recommend this hotel as a venue enough as our day was so special and I know its because the team in the Heritage went the extra mile to make it that way. Could not fault the Heritage Killenard, the service, staff, efficiency was just amazing, totally exceeded my expectations. Trisha our wedding co- ordinator was just amazing, she was on the ball, was so efficient. Was a pleasure to work with. Amazing hotel to deal with from start to finish. Nothing was too much trouble! Food was amazing. The staff went above and beyond to make our day perfect. Our guests are still talking about the amazing service they received on the day.I would highly recommend The Heritage as a wedding venue. Our wedding co-ordinator Avril was fantastic. Any queries we had at all, she was there to hand, on the lead up to our wedding. On the day of our wedding Avril and the team at The Herritage could not have made us and all our guests feel more at ease. Everything ran very smoothly, thanks to all the staff at The Heritage. We thoroughly enjoyed our wedding day and so did our guests. I would highly recommend The Heritage for a wedding reception. We couldn’t speak highly enough of Trisha our wedding coordinator and John in the function room. All the staff in general made our day extra special. Every thing down to the smallest detail was attended to with great dedication by Trisha. We would recommend this hotel as a wedding venue to anyone. This was a fantastic venue for our wedding. It's a beautiful hotel, the food was great (so many compliments from our guests) and the staff are brilliant, so helpful and accomodating. We got married in the Heritage Killenard last November. We could not have been happier with the hotel and the staff. The hotel was so beautiful, it really had the 'wow' factor. The staff were so helpful and made our day so special. Our wedding coordinator Avril took care of everything. This made the lead up to our wedding completely stress free. We're returning to the hotel soon for our anniversary and I cannot wait to relive the best day of my life in the beautiful surroundings of the Heritage Killenard. Our wedding at The Heritage, Killenard, was absolutely fantastic. I have nothing but praise for the hotel as a venue, and the service we, and our guests, received from the staff. The banqueting suite is lovely and the decor and chair covers were perfect. I love that the stage is recessed, so that the band can be setting up as the meals finishes, and the dancing can start as soon as possible. The room is also quite large, so that no tables had to be move (other than the head table) for the dance floor. 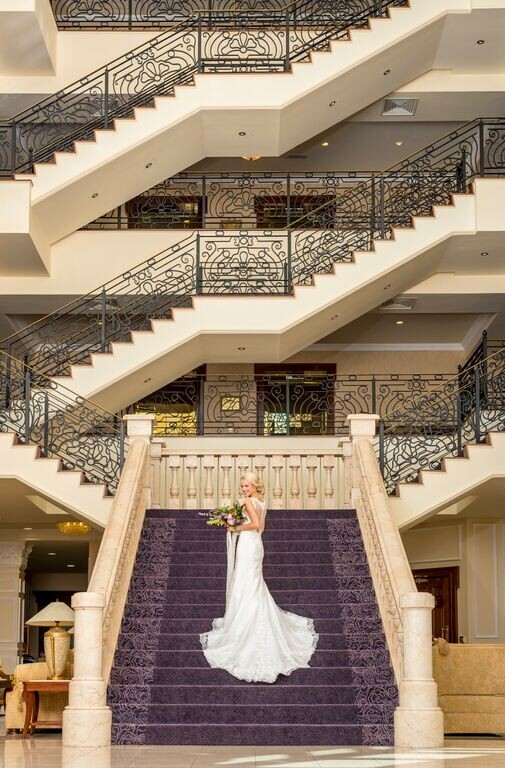 The decor in the lobby is beautiful, and the staircase is a fantastic setting for photographs. We had some external photos taken in the Fairy Garden, and although it's not a big space-it's perfect for outdoor shots; we actually have loads to choose from (on what was a fairly wet day in August!). There's a little cinema off the Gallery (drinks reception area), which was great for the kiddies. The bedrooms are fabulous and so comfortable, from the standard rooms right up to the wedding suite (choice of 3!). Great choice for breakfast too. What really sets The Heritage apart as a venue, is the service and the food. From our first visit with David, the wedding coordinator, I just had such a good feeling for the hotel. David had so much time for us, didn't rush us at all, answered all our questions and showed us every aspect of the hotel-including the different bedrooms/suites. In the run-up to the wedding, David and Trisha were on hand for any query, and were so accommodating and easy-going, I had no worries coming up to the big day. We had an awful lot of little touches, wedding favours, bits for the tables etc, no request was too big or too little-it was looked after. On the day itself, David was there ensuring everything ran smoothly. The banqueting staff were exceptional, everyone from the wait staff to John the banqueting manager and Martina, his second-in command. John checked on every table during the meal. Martina looked after the kids table and knew them all by name within about 5 minutes! John and Martina also looked after us on the second day of our wedding when we had a BBQ, and they were as professional and lovely as ever. We had a big wedding (250ish) and a six course meal, but the meal ran so smoothly, all thanks to the staff; which is no mean feat! That brings me to the food! Exceptional! As I said we had a large weeding, with a choice of starter, main and dessert. The food was incredible-cooked perfectly, hot when it arrived and delicious. I can not tell you the number of people who have complimented the food and service, since the wedding. Nearly every time I see someone for the first time, it's the same 'It was a great day-the food!, the service!'. Literally, everyone comments on the food and staff. So it's not just a bride looking back with rose-tinted glasses. I can not recommend The Heritage, Killenard as a wedding venue enough-all I can say, is that if you're thinking about booking it as your venue-don't think about it-just book it! You will not be sorry! Staff were great very responsive & professional, really felt confident that everything would be taken care of as planned. The level of service was second to none and without fault.. Trisha, our wedding planner in The Heritage Killenard, was a true professional and made what could have been a very stressful day, into the best day of our lives.. The hotel facilities are just perfect and the staff couldn't do any more for us.. We would both truly recommend the Heritage Killenard as an ideal location for your wedding day.. The staff of The Heritage Spa Resort and Golf Course could not do enough for us on our special day. No ask was too big or too small. The hotel was recently redecorated and looks amazing and we were wowed by the banquet room when we walked in, it looked magical. Our family and friends commented on how amazing and friendly the staff were, how good the food was and how fabulous the hotel rooms were. We have a great connection with the hotel now and can't wait for more visits. I can't recommend the hotel enough. Our wedding day was perfect from start to finish + The Heritage was a huge reason for that....the sunshine played a part too!! The Heritage does exactly what it says on the tin: provides a beautiful scenic background + 5 star service. Patricia, the wedding planner at the Heritage, was a pleasure to deal with: flexible + approachable, which is exactly what you need when planning a wedding, to keep the stress levels at bay. The service across our wedding weekend was excellent, our guests commented same. The food was also fantastic! For us, we found our perfect match in the Heritage when choosing our wedding venue: they provided us with all we needed to celebrate our special day + impress our guests. We simply could not recommend the Heritage more! Excellent service, friendly & efficient staff, beautiful location. We wanted for nothing and our guests felt relaxed and well looked after. Food was fabulous and plenty of it too - they made us feel like a five star couple just like their venue! Review by True definition of a 5* resort! Where to start...First and foremost - the staff are incredible! I have never come across such good service as they provide in the The Heritage Hotel, Killenard, They go above and beyond the port of call in every way they can from the service staff to the kitchen staff to the managers, the concierge and reception staff. The food is delicious and to this day people still comment on how great it was on our wedding day. I cannot recommend this hotel enough! Every time we go back up there for a visit the staff remember who we are! Love love love this hotel !!! Thanks for the lovely review, it was our pleasure and please keep in touch we look forward to welcoming you back soon. Well what can I say! Thank you seems such a small word for all that you and everybody at the heritage done to make our weekend so special and wonderful. We appreciated everything you did to help us plan a fabulous weekend. I am sure you already know how successful the entire wedding went off last weekend and how much your professionalism contributed to it's success! Every detail was seen to with enormous effort on your part from start to finish. The finesse and graciousness of yourself and front-line staff, I was aware, was backed up by those who diligently worked in the background....this, I believe, must be acknowledged! From our first contact with your good self during February / March 2013 right up until and throughout the wedding, my daughter and her husband were extremely impressed and pleased that they chose the Heritage Golf and Spa Resort as their wedding venue. This gave them great confidence and reassurance in the months that followed - right up to March this year. We were supported and helped by the ladies at Reception and in Reservations at every stage. I was amazed and very heartened to observe the generosity and cheerful sensitivity of the gentlemen in Concierge.........they looked after each and every guest from arrival to their departure irrespective of all the demands made. All our rooms were beautifully presented as expected of the hotel.....the condition and standards in the guest rooms are of utmost importance to guests as they retreat to their rooms to revive, refresh and rest. The Chef and his team were superb throughout....from the cooking skills and presentation of every delicious dish which was all done with exactitude, flair and artistry. Kindly extend our appreciation to the Chef for his help in planning menus and hard work throughout the entire weekend. The Restaurant, Lounge and Bar staff in all areas, were exceptional as they saw that guest's needs and requests were satisfied even during very busy periods....this was challenging at times but staff remained calm, efficient and helpful. As you promised, we saw how, because of the superb organization and training of the waiters, the meal ran very smoothly and every guest was individually considered. As a result, each course was served fresh without any unnecessary delays for any guest........this achievement must have been very difficult to master. We were very pleased with the high standard, presentation and friendliness we received in the Golf Resort on the evening prior to the wedding. This meant so much to us as people settled in and mingled comfortably and with ease! The Spa and Leisure Centre was also much appreciated by guests and, as we expected, standards and level of service was superb. My daughter and her husband, all families and friends thoroughly enjoyed their stay at the Heritage Golf and Spa Resort - from all the feedback, I am very sure they will and speak highly of their experience far and wide and recommend the entire resort to others. Thank you so so much for all your help and for making our wedding day so so special. Everything was perfect & it’s all thanks to you!! It’s very much appreciated! Just want to say thank you so much to you for all your help in planning our wedding day, you really were great and made it all so easy for us. Thank you again! I just want to take the opportunity to thank you and the staff of the Heritage for a truly amazing day. It was perfect, like a fairytale. Everyone thoroughly enjoyed the day. The compliments for the hotel were flowing throughout the night and we are still getting great feedback for the day. The Heritage is truly the ideal location for a wedding and we will be sure to let anyone know who is looking for a venue. We hope to get the opportunity to call back again in the near future. I just wanted to write you a mail to say a MASSIVE thank you for all the organisation that went into our wedding. We honestly couldn't have asked for anything more from our special day, it was amazing. Thank you so much for putting up the decorations in the hotel, they blew me away the moment I walked into the hotel. Every little thing was just perfect, I honestly can't complement you and the team enough. Our day wouldn't have been as magical if we did not have you working on it, it really was everything we could have wished for and more. I can't wait now to get back down to the Heritage, we're going to try and hold off until our 1st anniversary to make the trip even more special. Thanks again for all your hard work, we'll honestly never forget everything you did for us. We can't recommend the Heritage enough to anyone planning their wedding. I just wanted to send a quick email to thank you and all the staff at the Heritage for everything you did for us on the weekend of our wedding. We had a most enjoyable weekend, everything went off without a hitch and we felt so relaxed and pampered throughout the whole time we were down there. Our guests were so impressed not only with the venue, which was utterly stunning, but with the staff who couldn’t do enough for us and the food as well. The hotel made an excellent impression on our friends and family. Thank you again for everything. We look forward to our next visit to your beautiful hotel. What can we say, every last detail of the entire wedding wedding was AMAZING. We had the most unreal day for our wedding and enjoyed every minute of it and the following day. Thanks so much to you and all the staff. We've had so many compliments on the food, the staff, the hotel, the list is endless. You guys shone! We can't thank you enough for everything in the months leading up to the wedding and especially in the days before and on the day. You're fantastic at your job and you made it so easy for us. We felt like royalty on the day and just the tiny attention to details like all the staff knew our names and said hello, every last bit of it was above and beyond all of our expectations. I can't recommend The Heritage Golf and Spa resort enough to anyone thinking of having their wedding day with you and if they are lucky enough to have you as their wedding planner they will be sorted. Once again, thanks so much to all the staff and especially to you for all your help with our big day and the wedding weekend. I just wanted to drop you a mail to say thank you for everything. We never had a single problem from the first day we met you to book the venue. The day exceeded both our expectations and that is down to the attention to detail of yourself and all the wonderful staff at The Heritage. On a personal level dealing with you has been a pleasure. I have never met somebody so professional and competent and totally in control of what they are doing as yourself. All of our guests were blown away by the venue, the food and the service and they are all still talking about it. I have been to many weddings at many different hotels over the last 10 years and I have never seen the reaction from the guests to everything that we got from our guests at The Heritage. On what can be a stressful time for many brides and grooms I'm sure, I have never felt so relaxed in my life. I may have looked stressed but that was the heat! We recently got married and had our wedding reception in the Heritage Golf & Spa Resort. I couldn’t have been happier with the hotel and the service that was provided. From the moment we booked our wedding with David, who was a pleasure to deal with throughout, we knew the Hotel would be the perfect wedding venue. All the staff are so welcoming and were a pleasure to deal with from start to finish. The Hotel décor itself is fabulous and maintained to the highest level. The feedback we got from all our guests was incredibly - from the accommodation, to the food both at the wedding and in the restaurant & bar. Our wedding day went without a hitch thanks to all the staff at the Heritage Hotel which really is a first class hotel! The team at The Heritage Resort were fantastic and went out of their way to make us feel very welcome and played a big roll in making our Special Day a Very Special Day. The wedding team certainly made our wedding plans run so smoothly and were so helpful. Thank you for the most fantastic weekend at The Heritage Resort. Ask the Experts - "Do wedding guests expect an open bar or free drinks at the reception?"